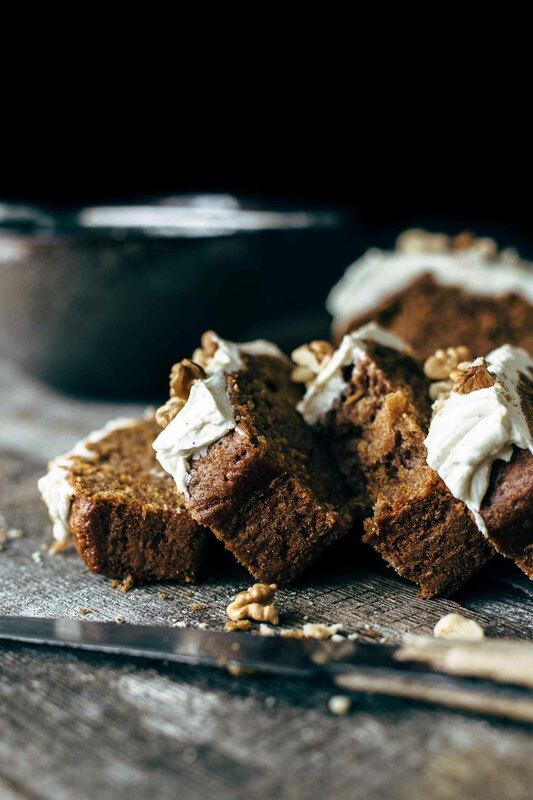 12 ingredients and 10 minutes of active preparation time is everything you need to make this super soft and moist Carrot Cake Loaf with Cream Cheese Frosting. Perfect for lazy baking days. Intense cinnamon flavor guaranteed. You love easy and quick baking recipes, right? Who doesn’t? Even if you are a passionate baker as I am, there are days where you are happy that you don’t need to be in the kitchen like forever to get your cravings satisfied. If you have such a day, then this recipe is a gold nugget. You don’t need a mixer just a whisk. And dirty dishes are reduced to a minimum. It can’t get better, you think? Oh yes! Not the easiness or the short preparation time is the highlight of this recipe. 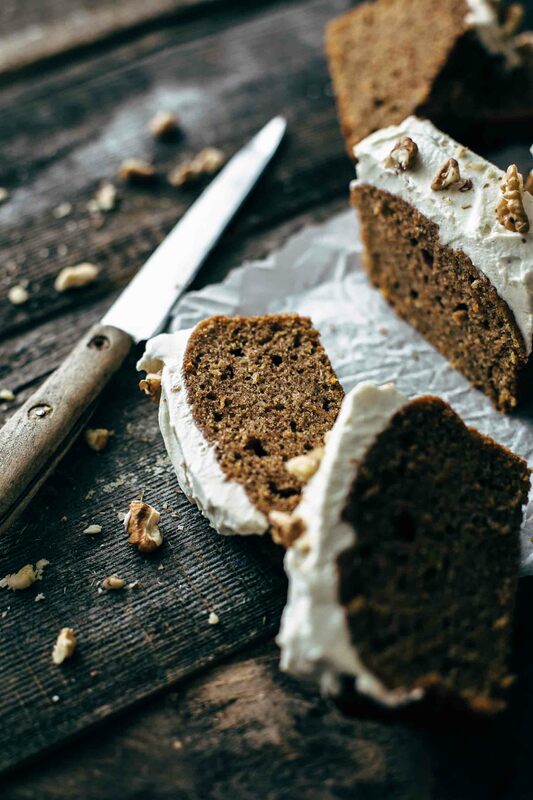 It’s the flavor and texture of this Carrot Cake Loaf. The texture is perfect. Moist but not too moist. Soft and fluffy. It’s also not overly sweet. The cream cheese itself is sweet enough, so it is better when the cake is not that sweet. Otherwise, you don’t taste anything else but sugar. I don’t know about you, but I really have a thing for cream cheese frosting. It’s like Nutella. Give me a spoon, and I could spoon the whole thing by myself. 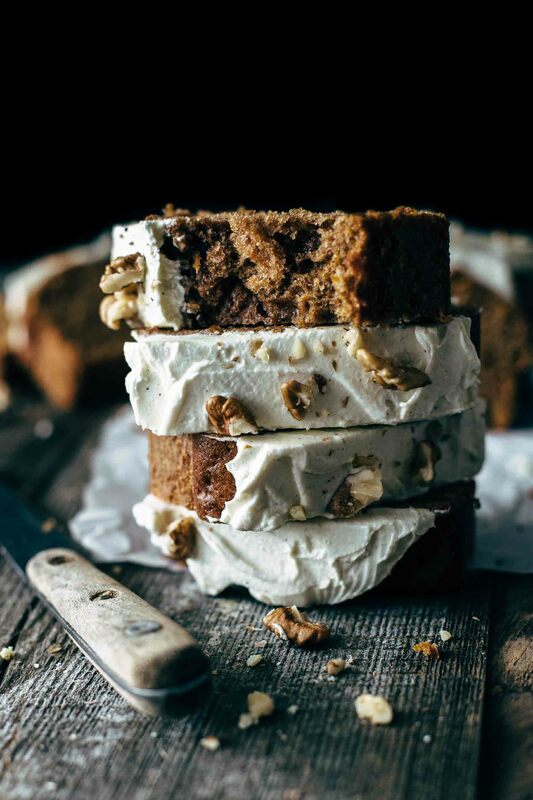 Carrot Cake Loaf and Cream Cheese Frosting belong to each other. There is no doubt. The intensive cinnamon flavor is a perfect fit for the cream cheese frosting. 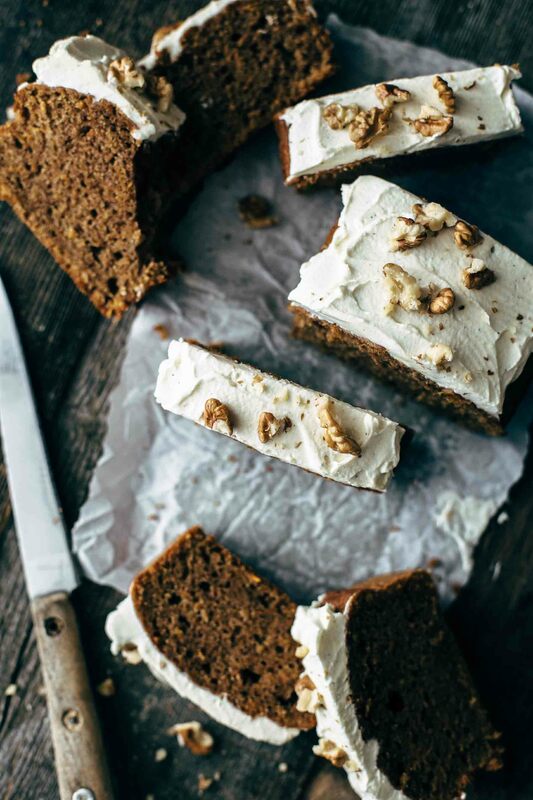 If you make this Carrot Cake Loaf with Cream Cheese Frosting recipe, leave a comment, rate it and tag a photo #alsothecrumbsplease on Instagram! Would love to see your snap! 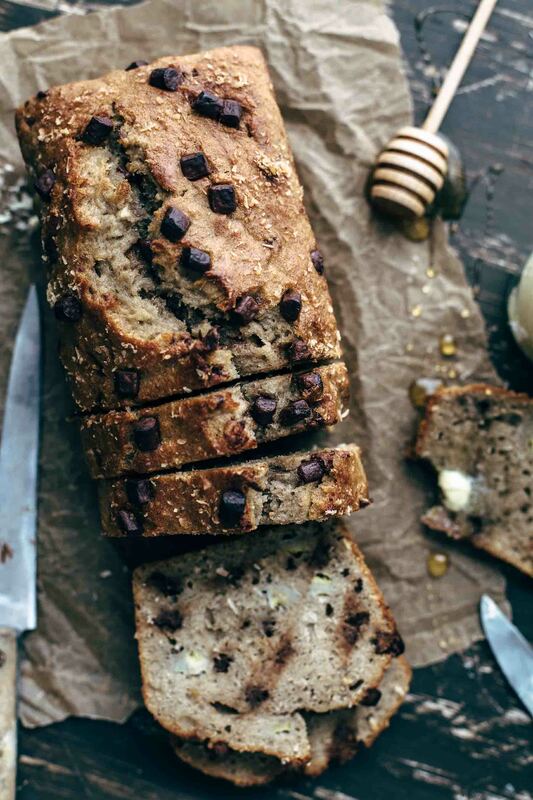 You may also like Best Chocolate Banana Coconut Bread Recipe, White Chocolate Mousse Chocolate Eggs + Video or click here to see all recipes. 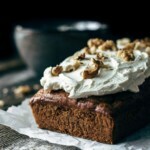 12 ingredients and 10 minutes active preparation time is everything you need to make this super soft and moist Carrot Cake Loaf with Cream Cheese Frosting. Perfect for lazy baking days. Intense cinnamon flavor guaranteed. Preheat oven to 350°F (175°C). 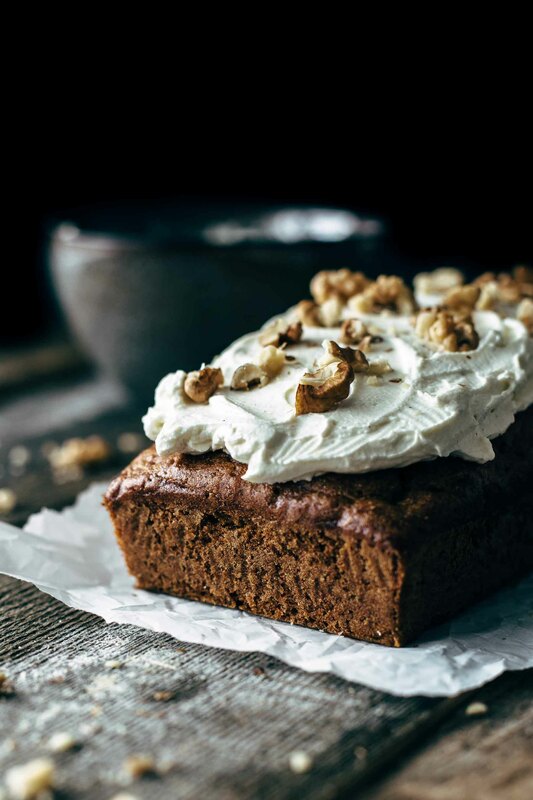 Line a 9x5 inch loaf pan with parchment paper with an overhang on the sides to easily lift the Carrot Cake Loaf out of the pan after baking. Set aside. Combine flour, baking powder, cinnamon, and salt in a small bowl. Set aside. In a large bowl whisk together eggs, oil, sugar, and vanilla* just until combined. Add dry ingredients and stir to combine. Stir in carrots just until combined. 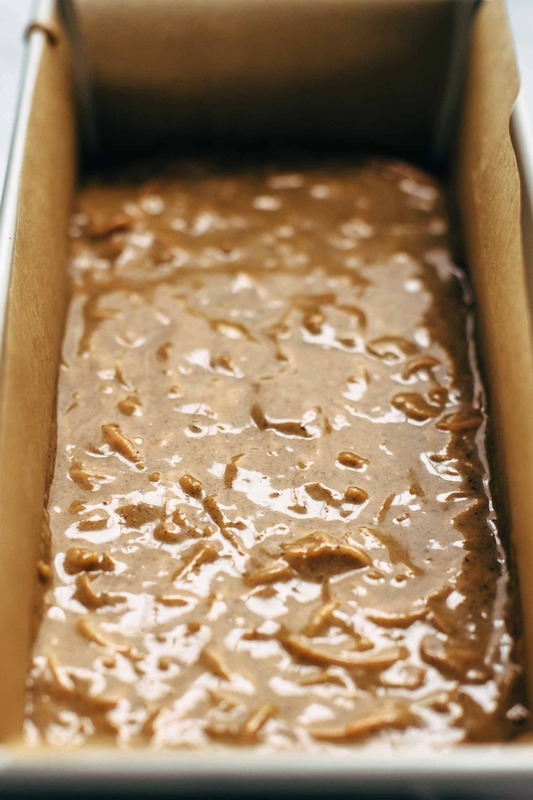 Transfer batter to the prepared loaf pan and bake for about 35-40 minutes or until a toothpick in the center comes out clean. Don't overbake. Remove cake from the oven and cool in the pan for about 10 minutes. Then lift out of the pan and transfer to a wire rack to cool completely. Meanwhile, make the Cream Cheese Frosting. Therefore, mix butter with a handheld or stand mixer fitted with a whisk or paddle attachment until soft for about 1 minute. Add cream cheese and mix until creamy. Add sugar and vanilla* and stir until smooth and combined for about 1 minute. Spread cream cheese frosting on top of cooled carrot cake and sprinkle with nuts if desired. Store in an airtight container in the refrigerator up to 3 days. Yes please!! This looks amazing! Thank you so much, Karly! Happy that you like it.